To inspire students at Mercy High School in science, technology, engineering and math (STEM). Through a FIRST Robotics program, we encourage young women to choose STEM career paths. We promote learning through a mentor-guided and student-led effort to design, build, program a robot and manage a competitive team. Team 1481 was established in 2004 at North Farmington High School in Farmington Hills, MI as the RoboRaiders. In 2007, Team 1481 disbanded and the number stayed dormant until 2014. 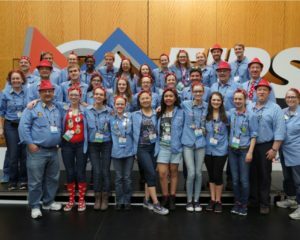 A small group of experienced mentors, including mentors previously affiliated with 1481, wanted to bring the FIRST Robotics experience to an underserved population. The mentors worked closely with FIRST in Michigan and connected with Mercy High School, an all-girl Catholic school. This affiliation provided a unique opportunity to introduce STEM to young women in a school that was yet to adopt the program. 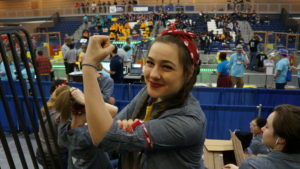 Team 1481 was resurrected and The Riveters were born. Through the hard work of our students and mentors and the support of our sponsors and administration, The Riveters expanded from a small group of students into one of Mercy’s largest and most successful teams. We started with low funding and limited workspace, but through our team growth and success, we managed to develop our workspace for all team functions, procure more sponsors, and increase student participation by 18% in the past year. We worked through our three competition seasons to prove ourselves as a viable FIRST competitor at the regional, state, and national level. We hope to continue our prosperity this competition season. The team voted to be called the Riveters because it was unquestionably the most appropriate name. Rosie the Riveter is an iconic WWII symbol of female empowerment; she represents the hard-working women who took on the jobs of men while they were at war. Rosie symbolizes skill building and service to our country, ideals that mirror the purpose of Mercy High School. For all these reasons, the team adopted Rosie’s slogan, “We Can Do It!” Rosie represents who we are as women in STEM and who we strive to be.